I often get inquiries about building wheels where the number of holes in the hub is different from the number of holes in the rim. 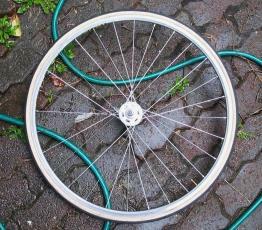 This is definitely an advanced wheelbuilding skill, especially when it comes to calculating the spoke lengths required. Benjamin Lewis has written an article on one particular instance of this, with details for the mathematically literate on how to calculate the spoke lengths. I have not actually tried this but it looks as if it might be useful for some specialized situations, so I'm posting this article with his permission. 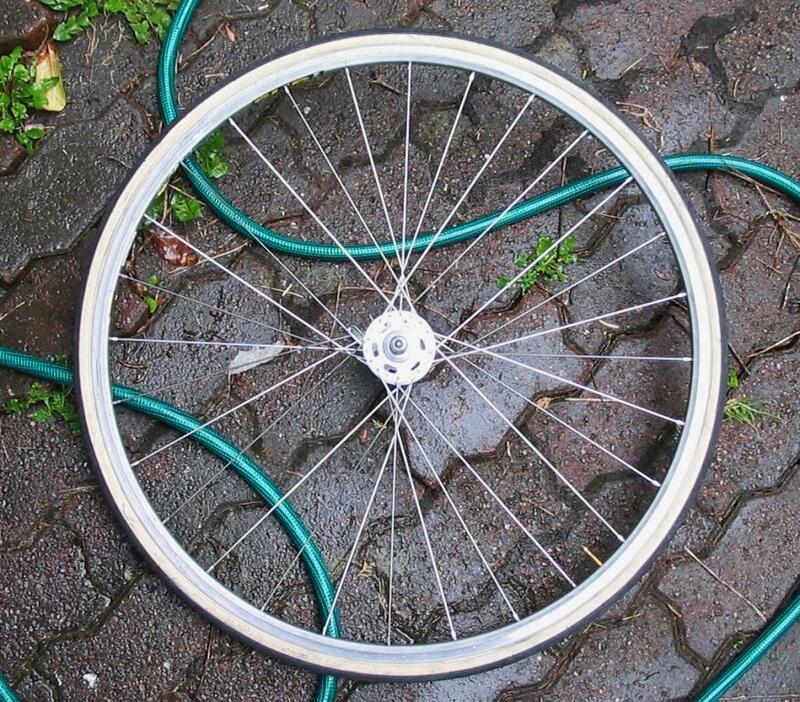 I found myself with a 28 hole rim and a 36 hole hub, and decided, against my better judgment, to build a wheel with them. The hub I had was previously used, and it is not recommended to re-lace a used hub in a different way, especially if radial spokes are used. I flagrantly ignored this advice. I experimented on paper with a number of different lacing patterns; unfortunately all of them required at least four radial spokes. In an attempt to reduce the stress on the hub flange from these spokes, I chose a lacing pattern that left the holes adjacent to these radial spokes vacant (click on images to enlarge). My hope and expectation is that even if a flange failure should occur, it will be no more severe than the breaking of a single spoke. 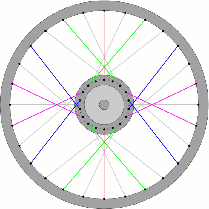 The lacing pattern shown in the above diagram requires four different lengths of spokes, shown in four different colours (spokes from the reverse hub flange are shown in grey). 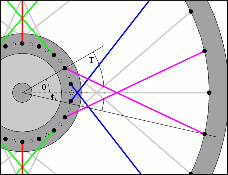 The diagram does not show which spokes are inbound and which are outbound, neither does it show which way the spokes cross each other. For the "crow's foot" spokes (red and green), I chose to lace them all outbound, with the semi-tangent spokes outside the radial spoke. The blue and magenta spokes alternate in-bound and out-bound, with the out-bound spokes laced underneath the last spoke they cross, and vice-versa for the in-bound spokes. The pattern on the reverse side is identical, but rotated by 90 degrees. 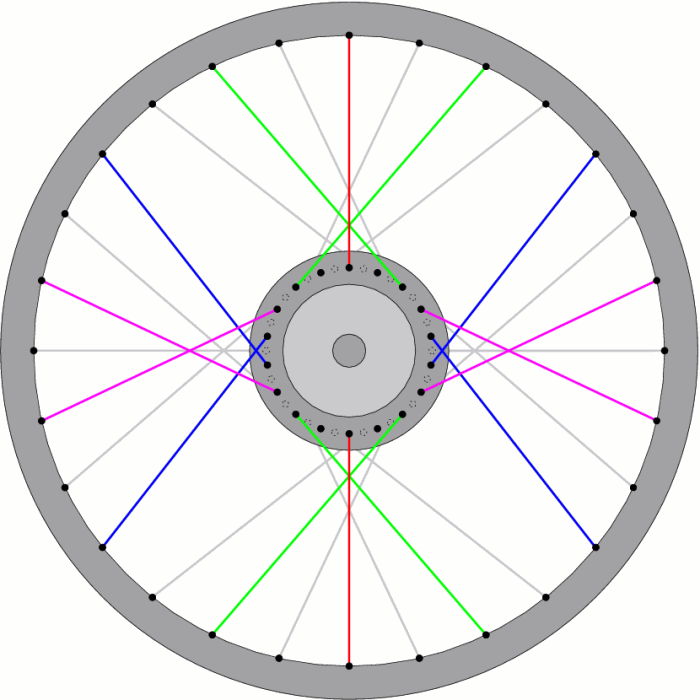 Calculation of spoke lengths is slightly trickier than on ordinary wheels, since the angle between the holes in the rim is different than the angle between holes in the hub. Although calculation of the spoke angles is not difficult, it is a little tricky to explain, so the diagrams below should help to clarify things. The "spoke angle" is defined as the angle between the hole in the hub flange and the hole in the rim, measured from the axis of the wheel. This angle is shown as T in the diagrams. The radial spokes are the easiest of course; they simply have a spoke angle of 0 degrees. 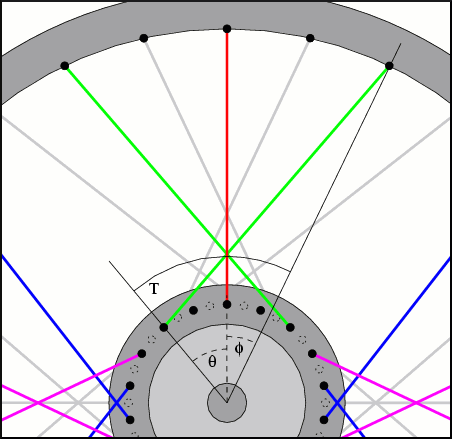 For the green spokes, we can see in the following diagram that the angle T is equal to θ + φ, where θ is the angle between the radial spoke and the flange hole for the green spoke, and φ is the angle between the radial spoke and the rim hole for the green spoke. Spoke lengths were calculated using equations from The Bicycle Wheel by Jobst Brandt (3rd edition, page 127), except for the calculations for spoke angles derived above. I wrote up a simple Matlab/Octave script to do this for me, in order to eliminate the errors I often get when I do things by hand. where D is the Effective rim diameter, d is the diameter of the hole circle in the flange (centre to centre), W is the flange spacing (centre to centre), and S is the flange hole diameter. Spokes stretch, and rims compress, so round down the resulting values of length! The wheel build is fairly straightforward, although complicated by the fact that so many different spoke lengths are used. I found it very helpful to place pieces of masking tape next to all the holes in the rim and hub, and colour code them with markers. Make sure to lace the inbound spokes first! Since the spokes are of different lengths, they will ring at different pitches when plucked even if they are all at the same tension, so it's a little more difficult to achieve even tension. I just made sure that all the spokes of a given colour were at the same tension as each other. The rim is a used Mavic Reflex. It is a socketed double walled rim (yay! ), but anodized and with welded joint (boo!). Spokes are DT straight gauge. I was trying to do this cheaply, and the LBS where I bought them didn't have butted spokes in the lengths I needed anyway. In fact, they only had spokes of even length, and my calculations called for odd lengths after rounding down. In the end I got two of the lengths rounded quite a bit down, and the other two rounded slightly up. It worked okay. Hub is some Shimano high flange that I found used; needless to say I broke the wheel building rule against re-lacing a hub in a different pattern. Bearing races appeared to be in excellent condition; I replaced the shot cones and bearings for a paltry sum.